Fundraiser by Dam Sense : Orcas Need SALMON To Survive! 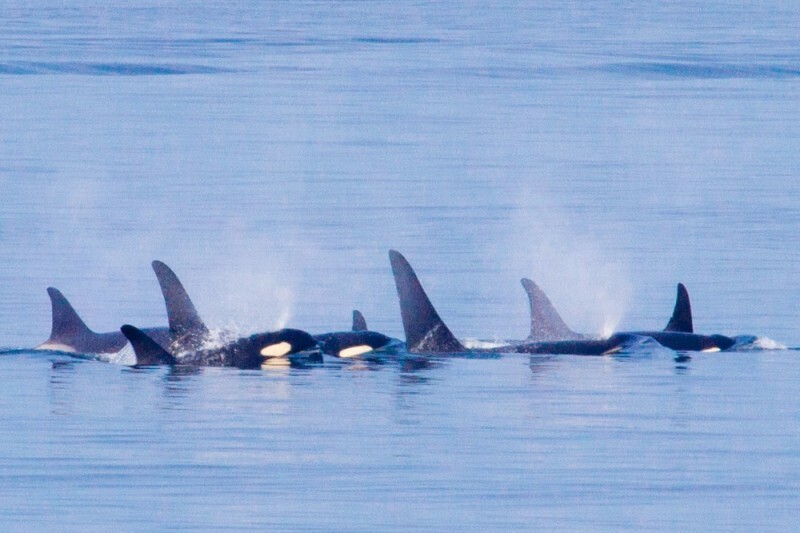 Southern Resident Killer Whales do not have enough to eat & are at risk of extinction if humans fail to recover large salmon runs! I am asking for funds to support our effort to inform The President, Federal Agencies and Regional Elected Officials and inspire them to take action to breach the 4 Lower Snake River dams, giving salmon a fighting chance to repopulate historical spawning habitat & rebound. The Snake was once one of the greatest Chinook salmon producers in the world and provided abundant salmon, sustaining hundreds of species from humans to killer whales. Salmon runs there have dropped below 3% of historical estimates. The four dams with their warm slack water reservoirs are killing what is left of these salmon and the river. Costs to American taxpayers are in the millions of dollars each year but the dams no longer serve their intended purpose. Dam expenses outweigh benefits today by a ratio of 6 to 1 and costs are expected to increase significantly over time. These iconic Orcas are endangered and at risk of extinction in the near future. Lack of Chinook salmon prey is a primary risk factor for them. Given the roaring success of rapid ecosystem regeneration demonstrated by the recent removal of two dams on the Elwha River, the same may be expected for the lower Snake. NOAA has shown that dam breaching by itself would likely lead to the recovery of lower Snake River fall Chinook. A natural, free flowing, healthy river will reinvigorate the local economy with new recreational and agricultural opportunities in addition to providing pristine habitat for salmon and many other native plant, animal and fish species. The enormous workload to research and communicate about the breach plan and its’ economic and biological benefits cannot be completed by me and our volunteers alone. Your donation will pay for 1) help from agricultural, recreational and transportation economists and fisheries biologists who will research and describe impacts, 2) travel to and from Washington DC for advocacy, and 3) near-term help to coordinate the work and multimedia communication campaign. As the breaching work begins, government funding for dam maintenance & operations can be shifted to other far more beneficial water resource projects that add value to the Nation and are in need of funding. Local and regional political will is also a remaining roadblock to breaching the dams. And, every voice counts! Please visit this Dam Sense webpage to learn how you can make a difference. Like Dam Sense on Facebook and Follow @damsnse on Twitter. The initial goal is $50,000 by April 1st and the remainder by June 1st. Be part of the solution to bring back Chinook salmon, save Southern Resident Killer Whales, bring new opportunities to communities and save the American taxpayer millions of dollars! At DamSense you can Get the Truth and Change the Vision for the four Lower Snake River dams. Learn more about whales and salmon at SRKW Chinook Salmon Initiative. We seldom ask for donations but expenses are being paid out-of-pocket by a handful of volunteers to keep things moving forward. Your dedication to help #TearDownThoseDams by your actions, keeping pressure on elected officials is making a difference and very much appreciated. Now we’re asking you to donate whatever you can…even $10 can make a difference when many participate. PLEASE DONATE to the gofundme campaign. 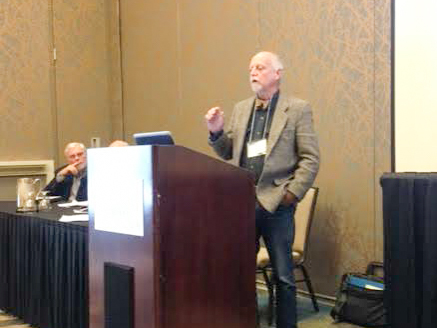 Attendees at a recent Pacific Northwest Regional Economic Conference in Vancouver were brought up to date on the urgent need to breach LSR dams by four panel members with extensive public service careers. A stunning conclusion was drawn. They pointed out that the Northwest Power and Conservation Council's Sixth Power Plan actually stated that the region can retire all of its existing coal plants, and remove the four lower Snake River dams, and customer’s monthly power bills will actually decline due to more efficient use of energy. But, the actions of the regional offices of the Corps, NOAA and BPA show they are protecting the four dysfunctional dams with perpetual delays and manipulated planning in spite of Judge Simon’s ruling rejecting those plans. The time to breach is this year, based on the valid and existing EIS, NOT years from now after further redundant and unnecessary analyses. Panel; Ed Chaney, Director, Northwest Resource Information Center, Rod Sando, former Executive Director of The Columbia Basin Fish and Wildlife Authority, Charles Pace, Portland Community College and James Waddell, former Deputy District Engineer, US Army Corps of Engineers. 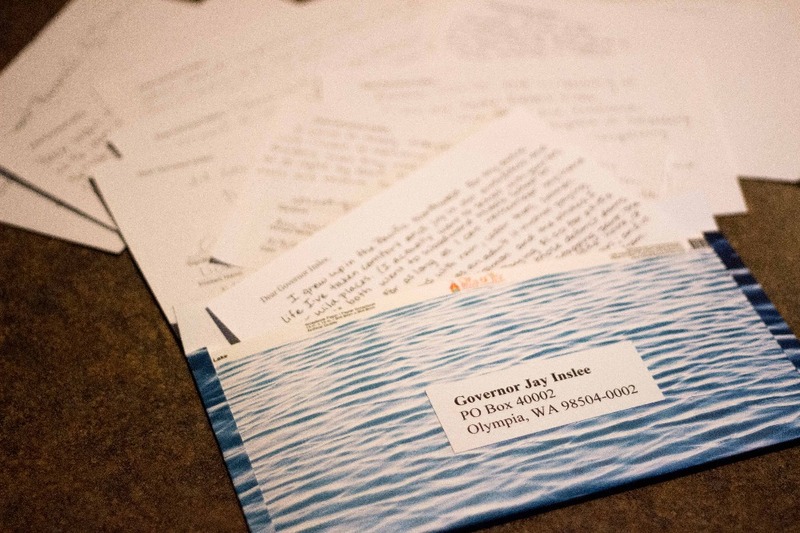 Hand-written postcards asking Governor Inslee to support LSR dam breaching finally on their way to Olympia! Thank you to all who wrote. Follow us on Facebook for upcoming activities. Seattle rocks and so do our donors! We had an amazing turnout for our event last Wednesday night. The audience was very engaged and wrote personal notes on postcards to be delivered directly to Governor Inslee! Ken Balcomb, Center for Whale Research helped us understand the urgency in recovering salmon to feed hungry Southern Resident Killer Whales. Howard Garrett, Orca Network was also there to lend his support. I share with you a deep passion for the SROs and the environment. I admire all the work you do in behalf of our SROs, I trust and respect your commitment to fix the wrongdoings we have made to the environment. I trust and admire your courage to call it sometimes as it is, BS! Thank you and I hope you have strength and resources to keep on going until we win, for the orcas, the salmon the PNW and for all of us.